Christmas is a week away and the panic is starting to set in. Last minute errands, attending multiple parties, then checking and rechecking that you got gifts for everyone on your list. There’s no need to worry because chances are you’re not the only one stressing out. Customized Girl understands the stress and anxiety that come with the holidays and we want to make sure you get to enjoy all the festivities that come with it. As many know, Pinterest has become the ultimate DIY and event planning resource. We cannot get enough of Pinterest at Customized Girl and we use it every day not only as a marketing tool but to research the newest trends in custom apparel. During our research, we’ve collected and stored amazing ideas and touches that will make your Christmas extra cheerful and bright. This board includes decorating tips. ugly sweaters, and delicious recipes. 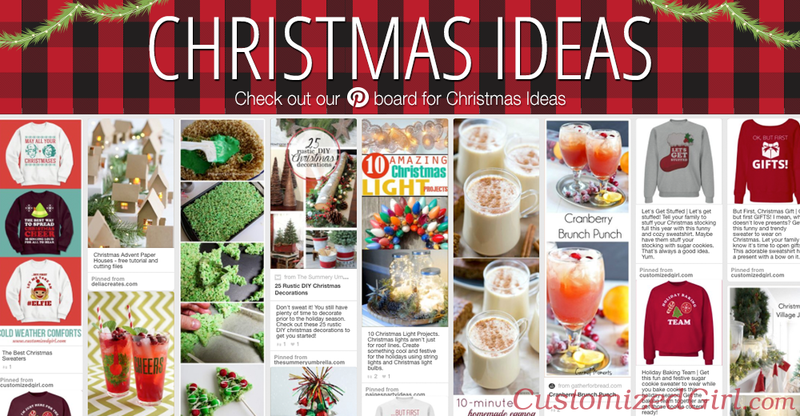 Stop your stressing and take a look at our Christmas pinterest board! 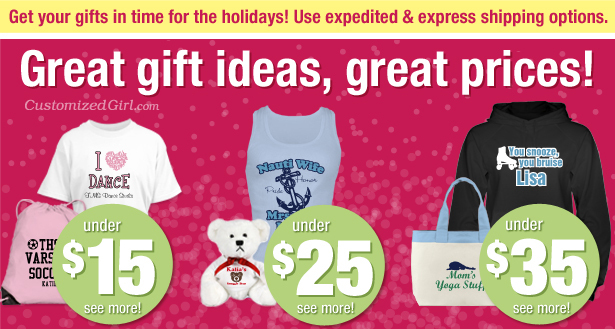 Still in need of some last minute gift ideas? 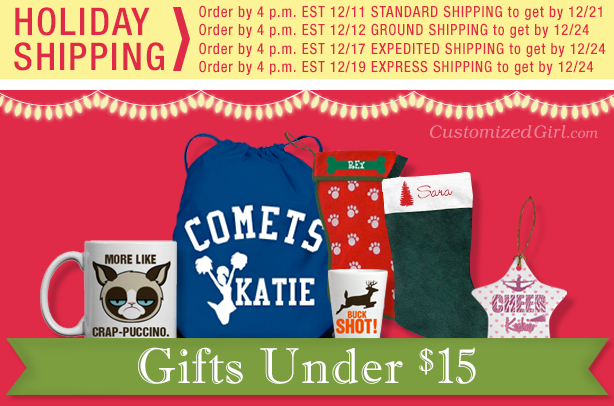 Here is a list of all the custom products we offer at Customized Girl that are great gifts for this holiday season! Dad’s are grilling masters, spider killers, handymans, and in general, just the best. They give their kids the world and do the best to lift you up when you are down. Dad’s are selfless and don’t ask for much so why not do something really special for the Old Man this year? To help nudge you in the right direction, we’ve put together some suggestions of Father’s Day gifts that we know can help turn his Father’s Day into one he’ll never forget. 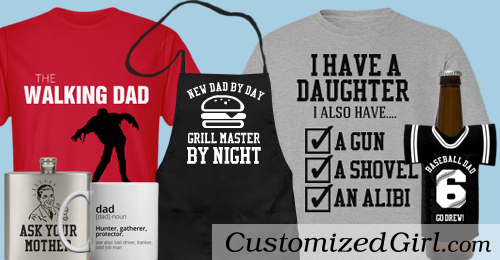 Customized Girl offers a variety of accessories that you can easily personalize for dad and his style. 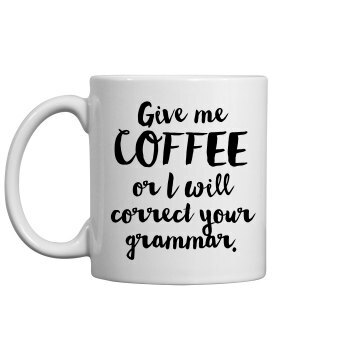 We’ve got custom mugs for coffee lovers, custom flasks, and custom koozies for Dad’s who love their alcoholic beverages. Go all out and customize a tailgate hoody. Yes, that is a insulated pocket to hold your beverage of choice. It’s kind of amazing. Does your dad love to grill? 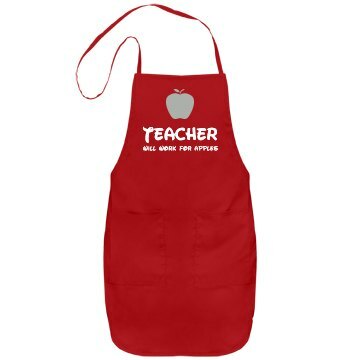 Then design a custom apron to show that you love and appreciate his grilling skills. Your design can be as simple as “#1 Griller” or more unique and funny by adding an inside joke. One of our personal favorite Father’s Day gifts for Dad are matching father son shirts and matching father daughter shirts. These matching shirts are ridiculously cute for soon to be and new fathers. It honestly doesn’t matter what you get for Dad this Father’s Day as long as the thought and effort is there but make him feel like the man, the myth, the legend that he is with a personalized Father’s Day gift. Being a teacher is one of the most important jobs anyone can have and is often a thankless job. 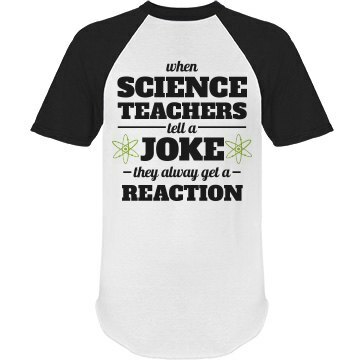 When it comes to giving teacher gifts, it truly is the thought that counts. Teachers give our children the biggest gift of all so why not put the extra effort and thought into a personalized teacher gift. 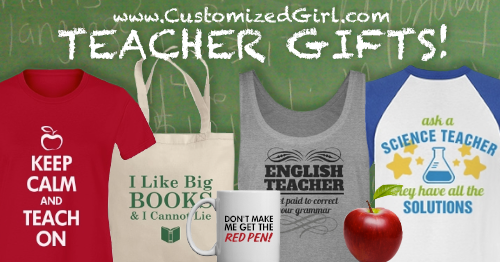 Customized Girl offers a variety of teacher designs that include products with simple, easy to add names and school year but also designs that poke fun at their profession. 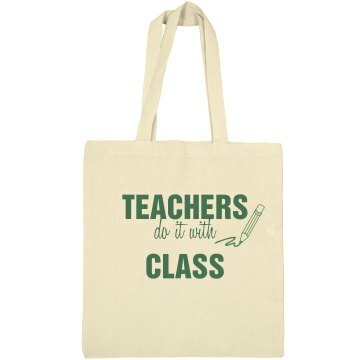 Not all teacher gifts have to have the standard name and school year. Make their gift personal by including details like their favorite colors, sports teams, or hobbies. Our design center makes it easy to start from scratch or take any design from our gallery and swap it onto a different product. 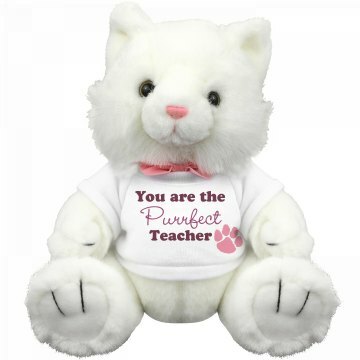 Here is a list of personalized gifts your teacher will without a doubt love. During teacher appreciation week and at the end of year, we should celebrate our teachers and let them know how much they mean to you and your child. 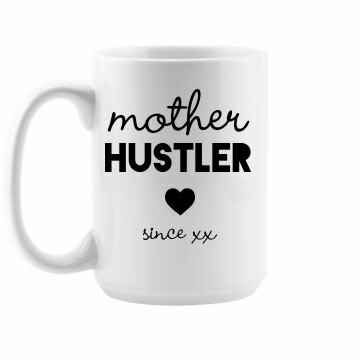 Design a gift that means something on a personal level or an idea that will make them laugh. Teachers have a large impact on your child’s life so make sure we celebrate and thank them with a gift they will cherish all year round. Is your nice list getting a little out of control? 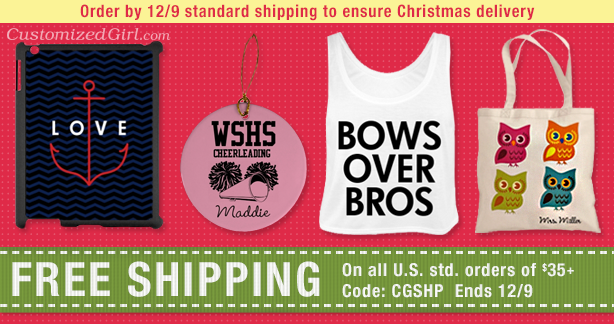 Keep this year’s holiday affordable with Customized Girl’s gift guide! 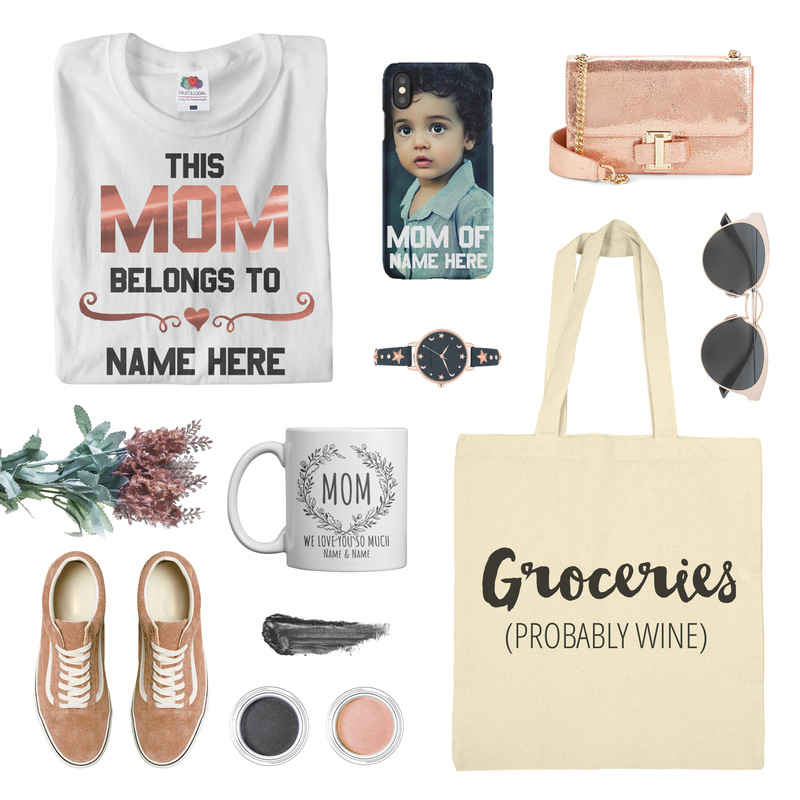 Create custom gifts they are sure to love! And don’t forget to sign up to have our weekly promotions sent to your inbox! 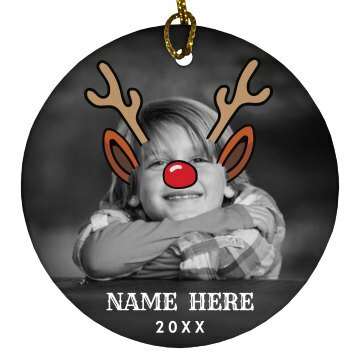 How to Make Custom Photo Gifts for the Holidays! Want to make a one of a kind photo gift this holiday season? This post offers step-by-step instructions on how to design a custom photo gift that is perfect for anyone on your nice list! Step 3. Choose your item. CustomizedGirl.com has a huge selection from junior and relaxed fit shirts to mens and youth shirts. We also have a variety of accessories. If you need more than one style (like both mens and womens shirts) for your order, that’s no problem. We’ll address that later in Step 7. Just choose one of our items to begin. Step 4. Let’s say you chose the Junior Fit Basic Tee (our best selling t-shirt!). You are now in the easy-to-use Customized Girl Design Center. The first thing you can do is start adding your very own text. You can then change your text size, font, color, and even add an outline color. You can also arch your text. This example will be a custom gift for mom! Step 5. To upload your image, simply click our “Upload Image” tab. From there, you are able to search your computer in order to find the photo you would like on your item. Once the photo has been uploaded, the placement and size can be adjusted. Step 6. You now have the option to add names or numbers to the back of your item. If you don’t want to add names and/or numbers, then simply enter your desired size and quantity and click the “Add to Cart” button. Step 7. Once in the shopping cart, now you are able to quickly and easily add more styles with the same design to your cart. The “Copy Design” button will take you back to the Design Center, where you can click the “Swap Out Item” tab, choose the category from the drop down menu, then select your item. Once all of your items have been selected you’re ready to check out! Don’t forget, you can also create your own custom hoodies, custom bags, and even your own personalized pillowcases! Check out our gallery of photo gifts today!